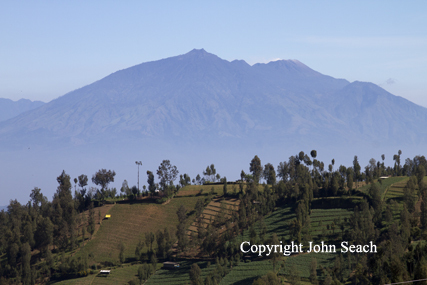 The volcano consists of two peaks Arjuno (3339 m) and Welirang (3156 m) separated by 5.7 km. Craters are aligned on SSE-NNW line. Solfatara are located at two places on Welirang. Satellite images showed hotspots in at the summit region between August-October 2002. Steam plume was photographed from the Space Shuttle on 13th September 1991. Plume originated from Gunung Welirang. An eruption occurred in August from Kawah Plupuh on the NW flank. An explosive eruption occurred in the NW part of Gunung Welirang in October 1950.